The population of wild hogs has exploded across Texas and the South in recent years. Correspondingly, the interest in hunting hogs has expanded. Many local municipalities encourage the hunting because hogs cause tremendous economic damage through their rooting and eating habits. Hunting hogs can be dangerous but is still undertaken by people drawn to their tender meat and the thrill of the pursuit. Hogs can be hunted more effectively with some understanding of their feeding habits, and bait is often a critical component of a successful hunt. Trapping hogs combines elements of hunting and luring with feed. These traps are typically constructed with strong wire panels and shaped into a long box. The hogs wander through a door in the side of the box to eat a pile of grain or corn placed over a trigger. Once the trigger is activated, the door falls closed and the hog is trapped. Experiment with different foods; wild hogs love to eat, so a well-chosen bait can yield a catch. Be attentive to the movements of hogs through a particular area. Try to discover favorite wallowing areas, or common trails they use. Finding an appropriate place to lay bait for hogs gives the hunter a tremendous advantage. Take several ears of corn and soak them in water until the water smells sour. Bury the corn slightly below the dirt in a location that hogs frequent. When the sun sets, hide and wait; hogs are often most active at night, so your chance of shooting feral hogs increases during the dark. The bait and wait technique is a popular method for hunting hogs in the South. Hogs eat both plant and animal matter indiscriminately. They will eat everything from rotting carrion to worms to corn to cantaloupe. 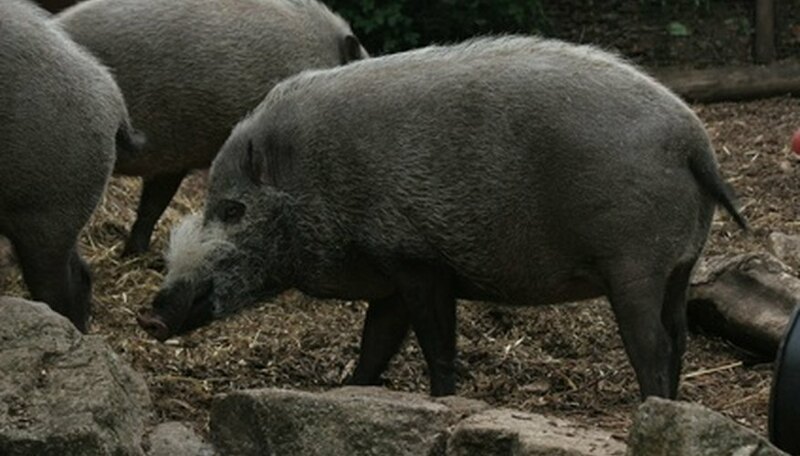 Fields of vegetables or tubers are favorites for hogs, and must be carefully fenced off. The abundance of food makes these prime areas to hunt hogs. Additionally, hunting around the borders of farms, with the permission of the landowner, can often be a good strategy. When hunting wild hogs, look for signs of the swine passing through an area. Wild hogs love to wallow in mud to cool off, so patches of mud that look disturbed or flattened usually indicate recent hog activity. These animals will also rub themselves against trees and telephone poles; the matted clumps of hair and mud are easy to spot.